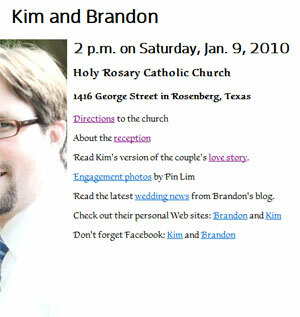 TypeKit is here and as more browsers start to adopt the @font-face rule, I decided to take it for the old free trial spin for BrandonandKimberly.com. It was easy. I went to their website, signed up, chose two fonts from the free trial selection and specified what domain I will be using them on. The free trial only allows for the use of two fonts on one domain. I then copied the two-line Java call and pasted it into the head of all the site’s pages, then configured the easy-to-use TypeKit editor to specify which font corresponded to which selector in my HTML/CSS of the site, and after a few minutes, I was done. I chose FF Enzo Web by FontFont for my headlines. I chose Scrivano by Outras Fontes for my regular body text. I know, I know â€“ it’s a little wild. And kind of a little fancy pants, but it really highlights the fact that I’m using a unique font on my Web site and if you’re cool enough to have an updated browser, then you’re cool enough to see it and, perhaps, be inspired by it and the brilliant web developer behind the Web site. All that, and Kim let me, so there. 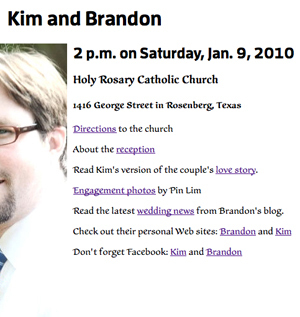 * Though BrandonandKimberly.com keeps crashing Safari. Doh! Man, I hate that browser. Also, I’m kind of disappointed in the way that various browsers display the fonts I chose. Check out these screen shots. Discuss. 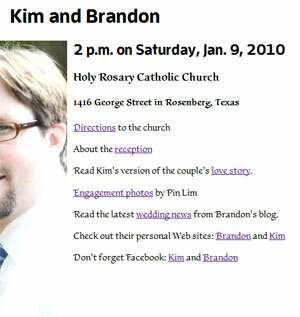 Firefox 3.5.5 (PC): This is how Typekit displays our wedding Web site on the browser of my choice. Internet Explorer 8 (PC): It doesn't display as nicely, but, maybe that's just my opinion. Notice how the weights of the headlines between this one and FF are inconsistent. Firefox 3.5.5 (Mac): It looks pretty good on Firefox for Mac.